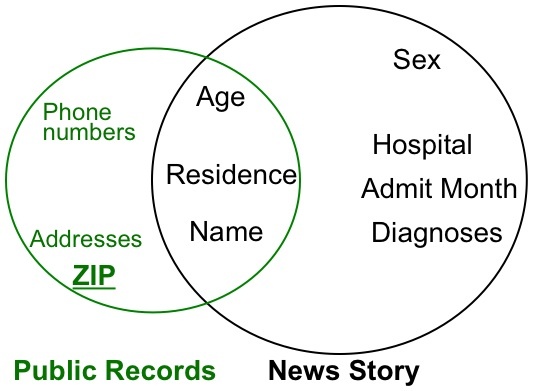 Information from news accident reports uniquely and exactly matched medical records in publicly available Washington State health data in 43% of the cases, thereby putting names to patient records. Patient-level health data from the State of Washington can be purchased for $50. 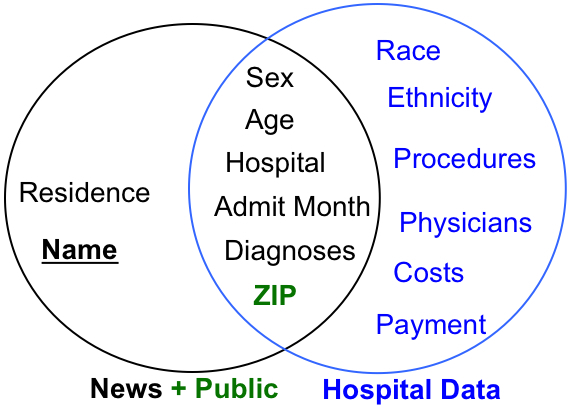 This publicly available dataset has virtually all hospitalizations occurring in the State in a given year, including patient demographics, diagnoses, procedures, attending physician, hospital, a summary of charges, and how the bill was paid. It does not contain patient names or addresses (only ZIPs). Newspaper stories that contained the word "hospitalized" and printed in the State of Washington were surveyed for the same year. Most news stories included a patient's name and residential information and explain why the person was hospitalized, such as vehicle accident or assault. This is the same kind of information an employer may know about an employee taking a medical leave, a creditor may know about a debtor citing health concerns as a reason for tardy payments, and family, friends or neighbors may know about a patient in a hospital. The first step was to look up the person's name, age and residence information in online Public Records to learn the person's date of birth and associated ZIP codes. Then, a direct comparison matched news story information and ZIP to hospital data thereby putting a name to a medical record. The fields used for matching were a combination of gender, age, hospital, admit month, diagnoses related to the incidence, and ZIP, Age is in years and months. For more details, see PDF paper. Are matched results correct? See Bloomberg article.